"Do you mean you've been lying to me Billy?" Growing up in the early 1960s in North Aerfordshire, [Editor's note: he's lying] I can very much relate to the character of Billy Fischer in the screen adaptation of Keith Waterhouse's novel (the stage and screenplay was co-scripted by Willis Hall). It was a time of change in England, politically and socially, and with his parents (Wilfred Pickles and Mona Washbourne) stuck very much in the conservative ways of finding any old job and making a career of it, Billy has every right to feel he is living below his potential in his menial office job for a mortician. A good friend of mine, who shall remain nameless, was very much like Billy, fancying himself a world leader or person of importance, when he was actually an underacheiving bum with no wherewithall to actually make something of himself [lying again]. However, our lead character in this photoplay manages to get himself messed up beyond all comprehension in the string of lies he manages to unleash upon the world. As I recall, England in the early '60s was at a crossroads of sorts, and the younger generation wasn't holding on to the traditions of their parents. Anyway, our man Billy has found himself in a bit of a spot; he hates his job, and while he sees himself as a starter, he has to muddle his way out of a few nasties before he can get on with it. First is his boss, Shadrack, played by Leonard Rossiter (2001: A Space Odyssey, Barry Lyndon), who has surmised that the company calenders that Billy was supposed to mail had somehow been absconded, and he had made off with the postage. Then there's his financ�e, Barbara (Helen Fraser), dim and cold as an ice chest and not liable to thaw before the big band is on her finger...if you know what I mean. Then there's Rita (Gwendolyn Watts), a mouth with a motor on it, who also thinks she's engaged to Billy, but is put off by the story that the ring she's supposed to be wearing is at the jewellers, when in fact Barbara is wearing it. Fortunately, Billy has a plan. Since he aspires to be a scriptwriter, he posts his resignation from his job on the basis that he has a position in London, working for the famous comedian and TV persona, Danny Boon (Leslie Randall), who just happens to be in town for the opening of a new supermarket. His parents are none-too-pleased by his seeming disinterest in holding down a job, yet are looking forward to meeting the girl with whom he is to be married�even though Billy isn't quite certain who that will be. When the carefree Liz (Julie Christie) shows up and offers him a way out of the whole mess, he must decide whether he can chase his dreams or if he has to face up to the web of deceit he has created. Of course, he'd rather be off in his own little dream world than dealing with the realities of his dead end life. Image Transfer Review: Criterion's anamorphic 2.35:1 transfer is nearly flawless aside from a few print defects here and there. Grayscale is rendered wonderfully, detail is sharp yet not over enhanced, black levels are solid and contrast is well preserved and not overly harsh. You do get the typical Cinerama distortion on the extreme edges of the image. This looks great. Audio Transfer Review: The mono audio track comes across clean with only a few areas that suffer from any form of distortion, primarily in horn dominated musical sections where the audio is fairly dense. Dialogue is easily discernable if not always understandable to someone this side of the pond. 1 Feature/Episode commentary by director John Schleshinger and stars Tom Courtenay and Julie Christie. Extras Review: For Billy Liar, Criterion has provided a handful of worthy supplements. First is a newly recorded commentary track featuring director Joel Schlesinger and actors Tom Courtenay and Julie Christie. The three commentators were recorded separately, and in Criterion style are very well edited together to form a cohensive narrative accompanying the picture. We also get an exerpt from the British TV series Hollywood: UK British Cinema in the Sixties. This 15m:36s featurette contains modern interview footage of Schlesinger, Courtenay and Christie, along with writers Keith Waterhouse and Willis Hall, who visit many of the settings for the film. There are also intercuts between the production and their modern locations for Billy Liar, in addition to footage and commentary on Schlesinger's first film, A Kind Of Loving. It was quite interesting to see all these locations as they are today, especially with the principals involved. The film's 04m:05s theatrical trailer is also included, presented in anamorphic widescreen. Two essays on the story are contained in the enclosed leaflet. 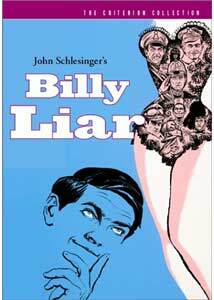 The truth be told, Billy Liar was nominated for four BAFTAs and spawned a stage musical and TV series. It looks at the age old conflict between generations, through the eyes of a man caught between the realities of life in Northern England and his fantasy world, which results in a string of fantastic tales that can't help but begin to crumble like the society around him. Criterion's presentation is exceptional, both for the feature and the supplements. Recommended.